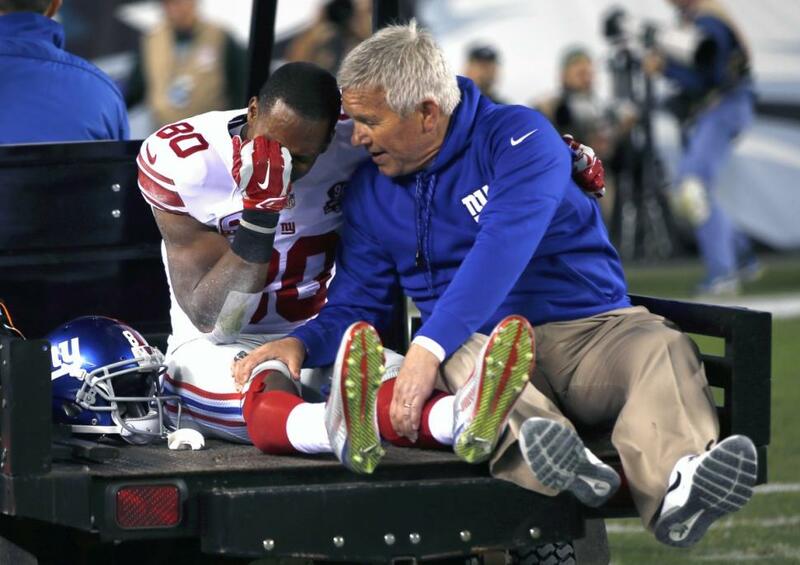 Victor Cruz is out for the year, so who should you pick up? It’s Mr. Fantasy’s premiere football column. He share his waiver wire grabs, drops, an fuggedaboutits. Injuries play a huge role in every fantasy football league, just as they do in the actual National Football League. Week 6 had more than their fair share of impactful injuries, so it’s time to go around the NFL and take a look at the newest injuries and how they impact their teams and yours. Victor Cruz WR, NYG: This is a huge blow to the Giants’ already shaky playoff chances. If you missed it, there will be no salsa dancing for the foreseeable future for Cruz after he tore his patella tendon in Sunday night’s contest with Philly. Swoop up Rueben Randle or Odell Beckham Jr. if one of them is available in your league. Randle is likely to be targeted more at this point of the season, but Beckham, the Giants first round pick in 2014, will get more passes thrown his way as the season goes on. Eli Manning and Randle are often not on the same page, so that could also play into Beckham’s numbers. Preston Parker’s targets should go up as well as a result of Cruz’s injury. The Giants have also signed Kevin Ogletree, but he won’t have much of a fantasy impact. Darren Sproles RB, PHI: The diminutive, but powerful running back is expected to miss two weeks with a sprained MCL. That could be just one week of games since Philly has a bye this Sunday. (Post-MRI talk even has a possibility of Sproles returning in week eight versus Arizona) Sproles’ nine fantasy points on Sunday was the most since he compiled 14 and 23 the first two weeks of the season. Not that it has hurt their offense, but Sproles was targeted four times against the Giants on Sunday night, but didn’t have a reception. In the prior week’s victory over St. Louis, Nick Foles didn’t throw Sproles’ way once. Chris Polk, who sat out Sunday’s game due to a hamstring injury has indicated he’ll be ready for the Cardinals game. Even if Sproles is out, Polk is not likely to get too many carries when LeSean McCoy needs a breather. Stevan Ridley RB, NE: The New England Patriots top back tore the ACL and MCL in his right knee and is out for the remainder of the season. Picking a replacement running back for the Pats, when it comes to fantasy football, is extremely diifficult. Head coach Bill Belichik uses so many situational formations it’s difficult to predict how many touches a game a player will get. Former Patriot RB BenJarvus Green-Ellis is a perfect example of this. He rushed for just 667 yards in 2011, but was a goal line specialist and scored 11 touchdowns. That being said, Shane Vereen is the favorite to handle the ball the most of any of NE’s backs…but look for your points from another team. Knowshon Moreno RB, Mia: Most owners had already picked up Lamar Miller when Moreno injured his elbow in Week 2. Now the former Denver Broncos standout is out for the rest of the year with a torn ACL in his right knee. Miller has been limited in practice due to an undisclosed injury so stowing Damien Williams on your bench might be a good long term investment. Turn out the lights, the party’s over. Time to ride the pines. Ah, good ol’ “Dandy” Don Meredith singing “Turn out the lights, the party’s over” back in the hey day of Monday Night Football. In this case the party is over for some football players. These guys aren’t hurt, they’ve just become ineffective. Matt Asiata RB, Min: When Adrian Peterson was suspended, the Vikings gave the ball to Asiata, who responded with 36 yards rushing and 48 yards receiving and a TD in week 2. Week 4 saw him compile the fantasy game of his life. In the 41-28 win over the Atlanta Falcons, Asiata rushed for three touchdowns and compiled 100 total yards rushing and receiving. But the game also was an omen of things to come. Rookie Jerick McKinnon rushed for 135 yards against Atlanta, on just 18 carries. The 3rd round pick from Georgia Southern still managed only 10 touches the following week, because Green Bay blew the game open early in a 42-10 rout. Last week, the Vikings held tough against a very good Detroit Lions defense, which saw McKinnon rush for 40 yards (11 carries) and catch all six passes targeted at him for another 42 yards. Meanwhile Asiata, despite 72 yards rushing against the Packers, carried the ball just twice against Detroit and had no receptions. McKinnon is clearly the starter now, though you may not want to start him this week against a tough Buffalo Bills defense. Larry Donnell TE, NYG: Donnell had a pretty awful 2013 campaign and was a breakout star this season until the last two weeks. He scored 11 points in week 1 vs. Detroit, followed by eight points against Arizona. His big week came in week 4 when he caught three touchdowns against the beleaguered Washington Redskins defense. But Donnell has recorded zero fantasy points the last two weeks. Granted his triple tap touchdown reception this past Sunday against Philly was called back by a holding penalty on offensive lineman Will Beatty, but either defenses have adjusted and/or Manning is looking elsewhere. With Cruz out, Manning could go back to Donnell, but this week’s opponent, Dallas, has allowed just two touchdowns to tight ends this season. That and the other Giants tight end Daniel Fells caught a TD pass in weeks 2 through 4. It’s a good time to bench Donnell. Chris Johnson RB, NYJ: Remember when Johnson was the studliest running back in the NFL? It seems like eons ago now. While he put in some serviceable performances in his latter days with the Tennessee Titans, his time with the Jets has been nothing stellar. Fans were excited when he had 68 yards rushing and another 23 receiving in week 1, including a touchdown, but Johnson hasn’t done much since then. He’s found the opponents’ end zone just one additional time.Teammate Chris Ivory is clearly the better back at this time and Johnson is likely to continue to see the football less and less. Cut Johnson loose and get a useful player on your roster. Jason Witten TE, DAL: The Cowboys tight end has just one TD reception this season and has not recorded more than eight fantasy points in any single game. But the Cowboys host the Giants this week and Jason Witten loves to play his division rivals. Last season alone, Witten caught eight of nine targets for 70 yards and two touchdowns in an opening night 36-31 win. In the Sunday prior to Thanksgiving, the Giants “held” Witten to four receptions for 37 yards, but he still caught two TD passes in a 24-21 Cowboys’ win. Though he didn’t catch a touchdown pass, the second meeting between the two teams in 2012 saw Witten catch a ridiculous 18 passes for 167 yards. In a word, or two words, start him! 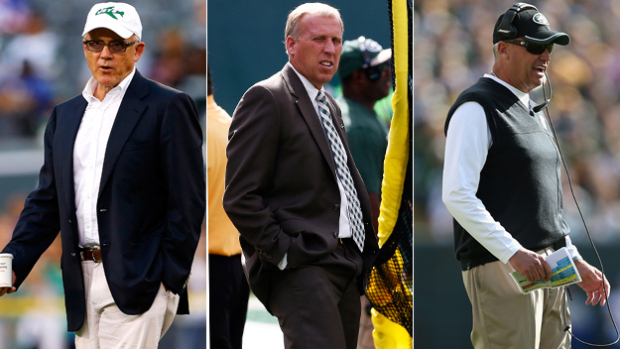 The Jets are in worse shape now than they were before head coach Rex Ryan arrived prior to the 2009 season. They are just a mess. Sunday’s 31-0 loss to the Chargers in San Diego was an embarrassment on just about every level. Not only did they not show up from the get-go, the Jets seemed to disintegrate in certain areas as the game progressed. And the things that went south were surprising and a bad omen for Ryan. 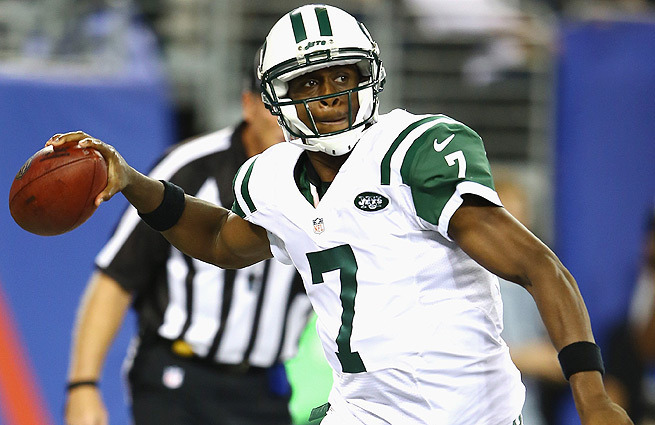 Considering the week that was heading into the game — the relentless criticism of general manager John Idzik, the fallout over the Geno Smith tirade on a fan following the Week 4 home loss to Detroit and the never-ending speculation about Ryan’s job security — Sunday’s effort and result were just about the worst things that could have happened. Now, it’s just open season on every single person associated with the franchise, including enabling owner Woody Johnson, who just last week tried to calm fears by standing behind his GM’s unorthodox plan to rebuild. Yet, the firestorm that has engulfed the Jets will not dissipate just because the great and powerful Woody has spoken, mostly because every week they look more and more like one of the worst teams in the NFL. As I have stated many times both online and in print, this season was never about a commitment to winning in the sense of what the fans and media expected. People who pay massive PSL and ticket prices to go to MetLife Stadium every week can understand the idea of rebuilding to a degree, but what Idzik is in the midst of trying to do — while on some levels admirable considering the Jets’ need to get younger and deeper in a league that has no use for the old and thin — has created such a backlash that there’s no telling if fans will ever trust him. Certain reporters have been going after the organization for years, mostly because of Ryan’s braggadocio ways back when he was a neophyte head coach. For even the more muted Rex of today, the only way to keep the media at bay is to win, but for the last three-plus years the Jets have at best treaded water. Since the plan to rebuild was put in motion things have only gotten worse for Ryan. As a result, no one cares about the AFC tittle game appearances in 2009 and 2010 anymore. They no longer act as ammunition for Ryan’s supporters, of which I still am but understand is becoming a losing stance. This coach, while a colorful character of the highest order and brilliant in certain aspects of the Xs and Os, hasn’t been successful for what will soon be four consecutive seasons. And his boss has done him no favors. Read the rest of this article for free at newyork.cbslocal.com. Column and photos used with the permission of wfan.com.